As a stero-typical 20-something year old, there is nothing better than brunch (especially when you have a love affair with food). Our generation seems to relish the alternative takes on classic breakfast dishes, and this recipe hits that spot perfectly with an ooey-gooey sweet and savoury blend. Place the blueberries and maple syrup in a medium saucepan and simmer over medium heat until slightly thickened, about 5 mins. Make a slurry with water and cornstarch in a separate bowl. Add the slurry to the blueberry mixture and simmer until thickened, about 2 mins. Remove 1 cup of mixture into a small bowl. Set aside remaining blueberry mixture and allow to cool. Once cool, stir in the basil and chevre until incorporated. Combine the eggs, milk, salt and pepper in a large flat dish for dipping the toast. Mix well with a fork. Slather a slice of bread with 3 tbs of the chevre and blueberry mixture. Create a sandwich with a second slice of bread. Dip the sandwiches in the egg mixture on both sides, allowing about a minute or two each side (for the bread to absorb the egg mixture). Place a teaspoon or two of oil and butter in the hot pan and place the bread slices into the skillet. Flip the toast when they are browned, 4 or 5 mins per side. 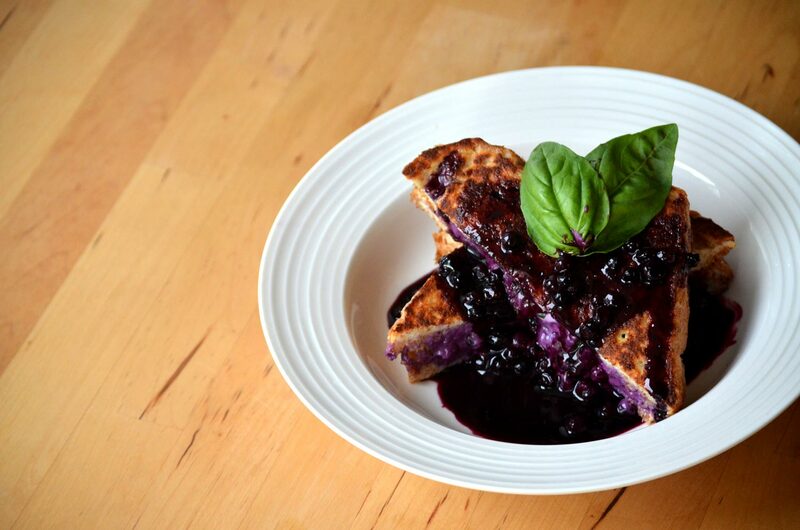 To serve, drizzle with about 2 tbs per sandwich of reserved blueberry compote.